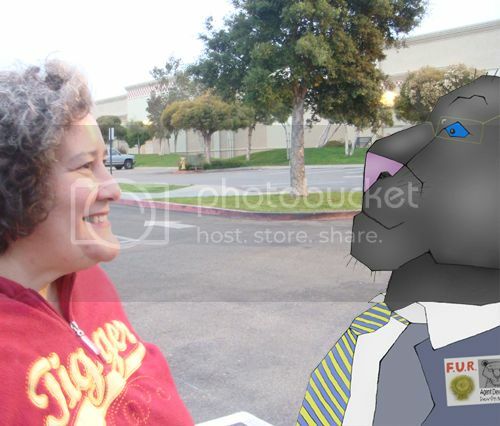 Your artwork is very stunning, very fantastic! The collection of beavers is amazing- I, too, didn't know there were so many beaver characters out there. I love the "Heroes, Heroines, Villains, Villainesses" pieces and they look awesome as your signature, no lie. The doberman, "Captured! 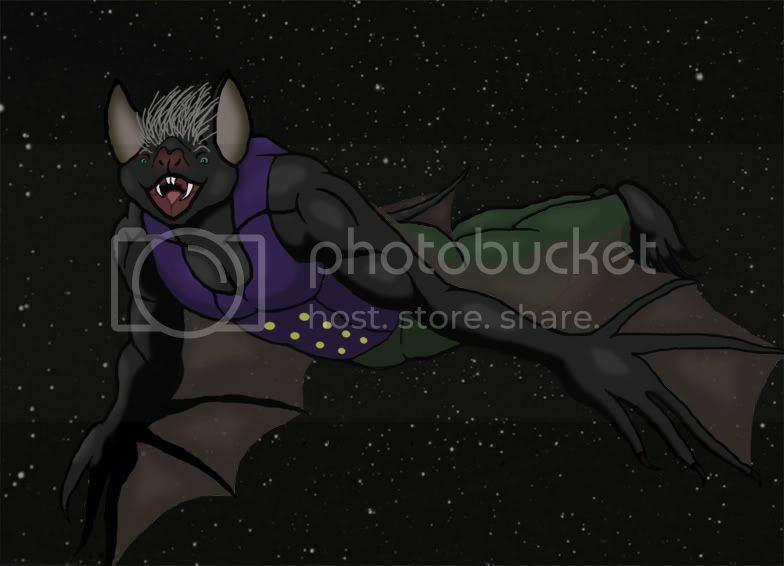 ", and the vampire bat are also amazing artwork. Keep it up. Remi Vitoux, my oft-drawn beaver-artist-superhero character, in my new alternative style. I was originally going to have him holding his hero mask in his other hand, continuing the “duality” theme that runs through a lot of pictures of him, but it just didn’t look right. It’s nice to draw him in a pleasant setting after the last picture I did of him, in which a supervillain had knocked unconscious and was dangling him upside-down by his tail (see "Captured!" above). Something of a return to form for me . 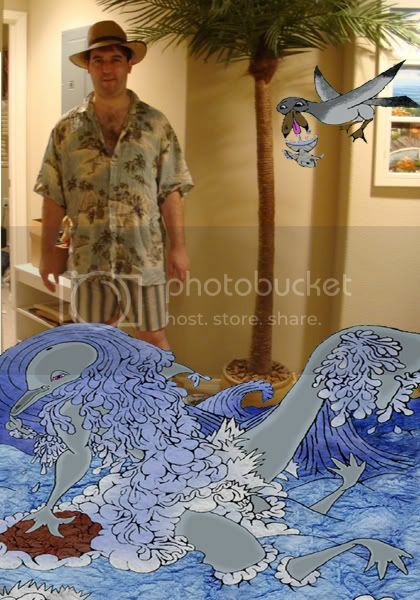 "The Real Animagurreal: Jam Session"
"The Real Animagusurreal: Beach Bum"
Well, the second one on the top row for your griffin banner is Griff from Gargoyles, I love that show! Great stuff, you have a really unique, kind of organic style, brings out a different feel to your pictures. Your subjects seem a bit obscure, but the more you do, the better you get! And yes, Griff is correct . 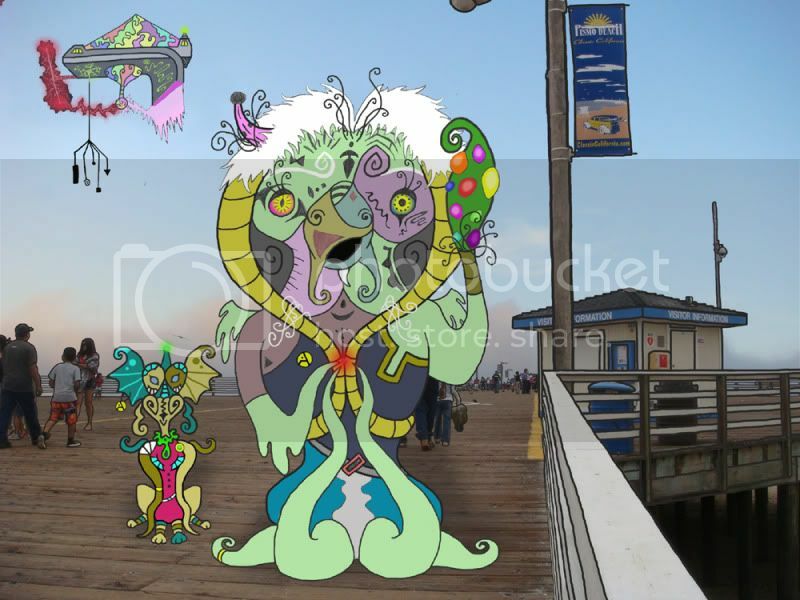 Two surreal aliens reveal themselves to you on the pier in Pismo Beach, California. 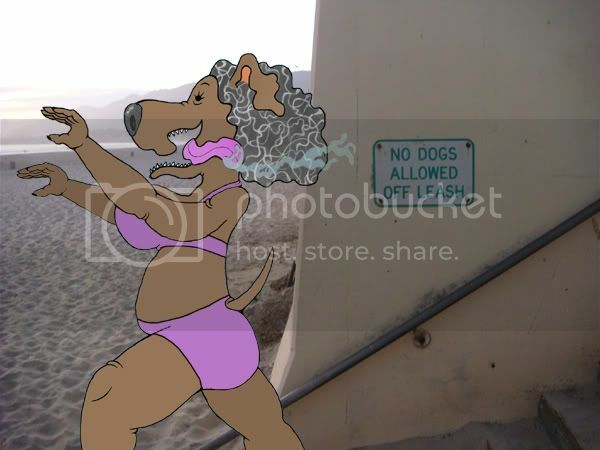 Another pic with a Pismo Beach background, with Iris the bloodhound. 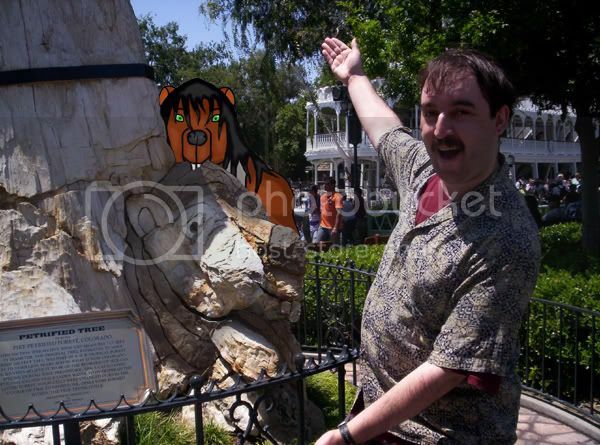 My Remi the beaver-artist-superhero was so exited by his trip to Disneyland he sculpted himself in the petrefied tree in Fronteirland. 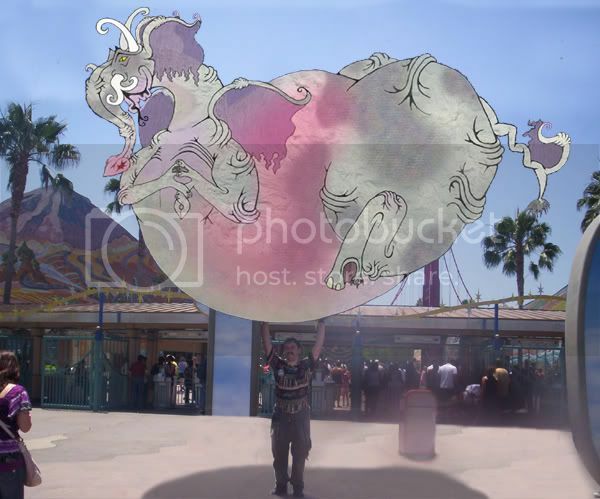 (Of course, immediately after this pic was taken, he used his powers to restore it to its natural state). 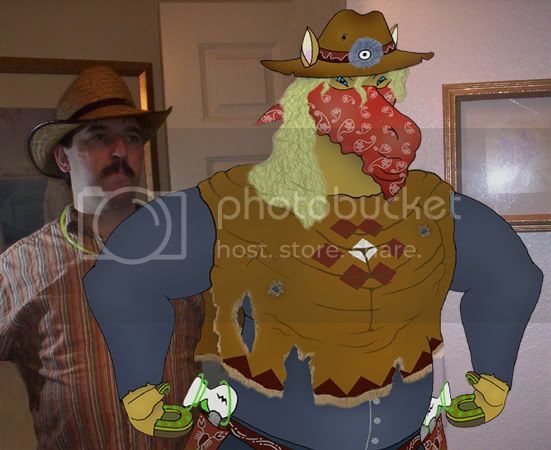 Me posing with "Roughshod" the cowboy outlaw horse. 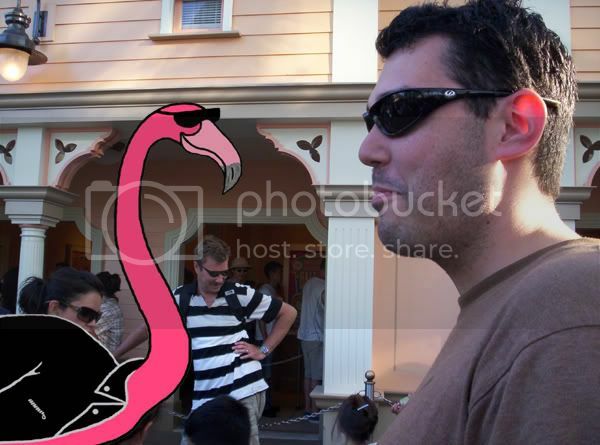 My friend Tomas on opening day of Toy Story Midway Mania at Disney's California Adventure with a flamingo. 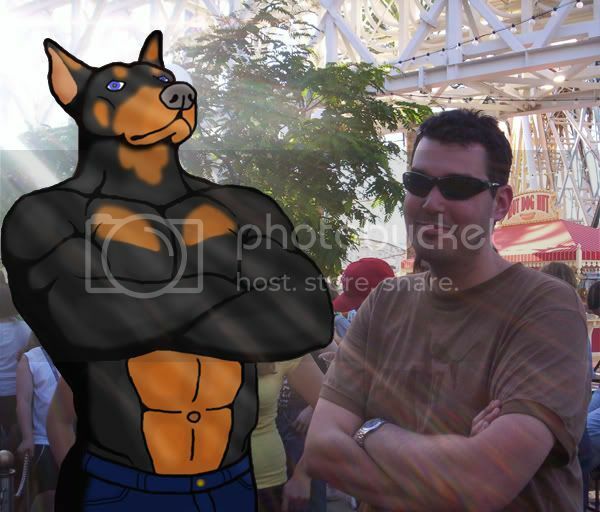 With Dobes Gillis, the doberman superhero. A collage of various pieces (by myself and others) of my gryphon character Ballad Quill. An action scene between skunk supervillainess Zoria Qumica and doberman superhero Dobes Gillis. Egad! I've been away so long, my thread is on PAGE TWO of the forum! And finally, this is the first completed illustration for the children's book that grew out of my "Escapia" novel concept. 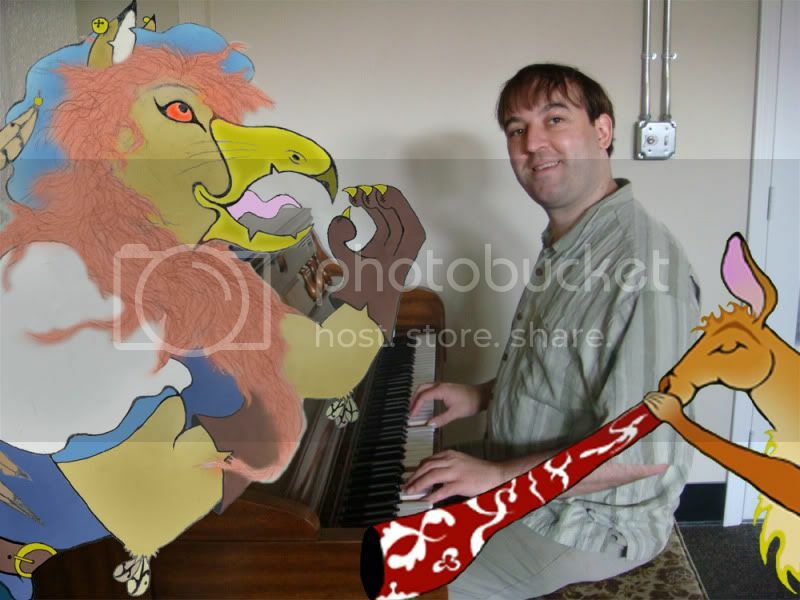 Here are Sondrew Hayne the human and his best friend Ballad Quill the gryphon, having fun singing a "Sweet Song" in a clearing near the edge of the woods. With this picture, I'm sort of trying to meld my old surreal, flat style with some new techniques I learned doing my (relatively) more realistic superhero artwork. Oh my god, Stitch is RIPPED! I wouldn't want to tangle with that little fella. Yeah, imagine him lifting 3,000 times his own weight! Eventually I'll probably do "good" Stitch, too . In Don Rosa's Donald Duck comic, "Mythological Menagerie", there's a reference to a giant beaver, so I couldn't resist putting my artist character Remi in there. Then, a few pages later, they mention a gryphon (they prefer the "griffin" spelling) so I put Ballad in as well. Huey, Dewey and Louie's dialogue has not been altered at all. Donald is the one running away in the distance in the first panel. Original comic written and drawn by Don Rosa. Copyright Disney. "Fair Use" as parody under copyright law. 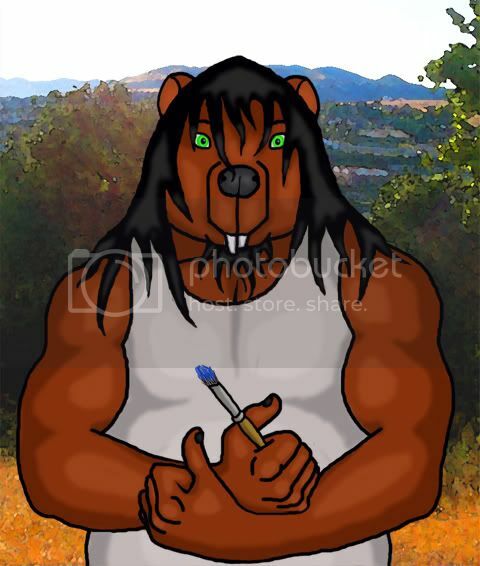 The characters Remi Vitoux the beaver and Ballad Quill the gryphon, their likenesses, and their dialogue were created entirely by and are copyright me. Done for a friend at work who gave me DVDs of all three seasons of the excellent series Avatar: The Legend of Aang. (I can't call it "The Last Airbender" anymore since Shyamalan sullied the name). So I finally got to see how the series ended! I hope she likes this pic . This is her female otter character, an avatar (master of all four elements), practicing her native art of waterbending. 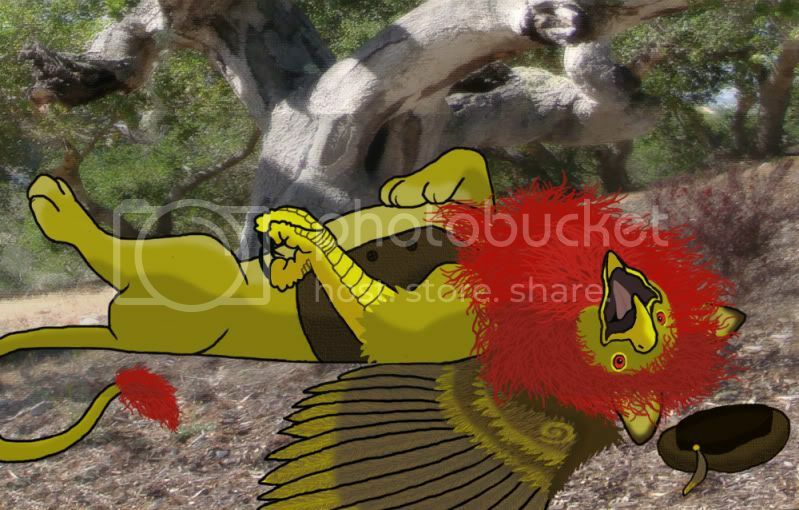 An illustration from my children's picture book project, "The Tale of Sondrew and Ballad", about human lad Sondrew Hayne and his gryphon friend Ballad Quill, who are both musicians. This is part three of a four-part passage on the types of songs they like to sing. Already done are Sweet Songs and Scary Songs, still to come is Silly Songs. "Dobes Gets Bitten Back" - Vampire bat villain Johnny Drac bites doberman hero Dobes Gillis in my ongoing battle series. 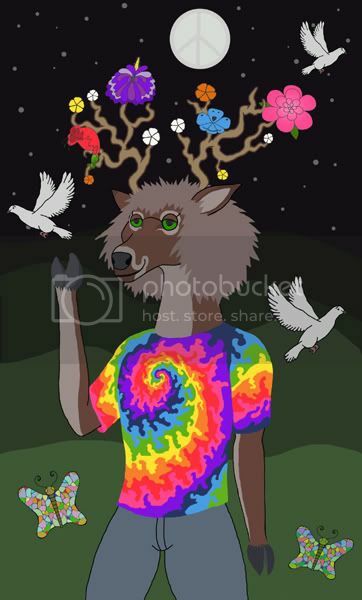 "June" - a surreal pic themed to the month of June (with 2 versions). Here are all four illustrations for this section of the book, in order (including Silly Songs again). You may notice that they look a little different in each pic. That's because I keep revising the character design with each illustration! (: I'm going to have to go back over all of these and revise them for consistency.